Flowing Rivers have kinetic energy, and this energy can be utilised to create electricity. 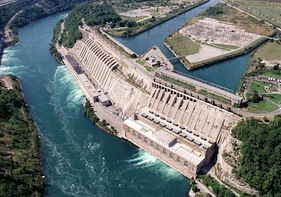 The energy is generated through a turbine when the water falls into it. To collect this type of energy a dam is built across a flowing river with the flowing water passing through a turbine to collect electricity. This is the way the majority of hydroelectric power and the power extracted is completely dependent on the difference in the height between the source and the outflow, and can be known as high head or low head production. The benefits of this type of energy are that it can provide a constant source of energy because the river flow is consistent. Furthermore, once it has been built, the supply of electricity is relatively cheap. A downside to this is that the building of large dams could be disastrous to the surrounding habitat for wildlife.What’s more, a site that is good for a hydroelectric scheme may not necessarily be close to towns. 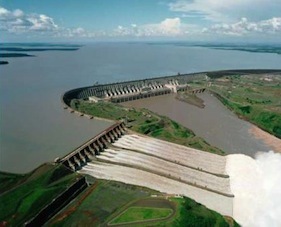 Also, by changing the flow of the river will affect the supply of water to land nearer the sea, and could subsequently cause problems for the irrigation of crops.